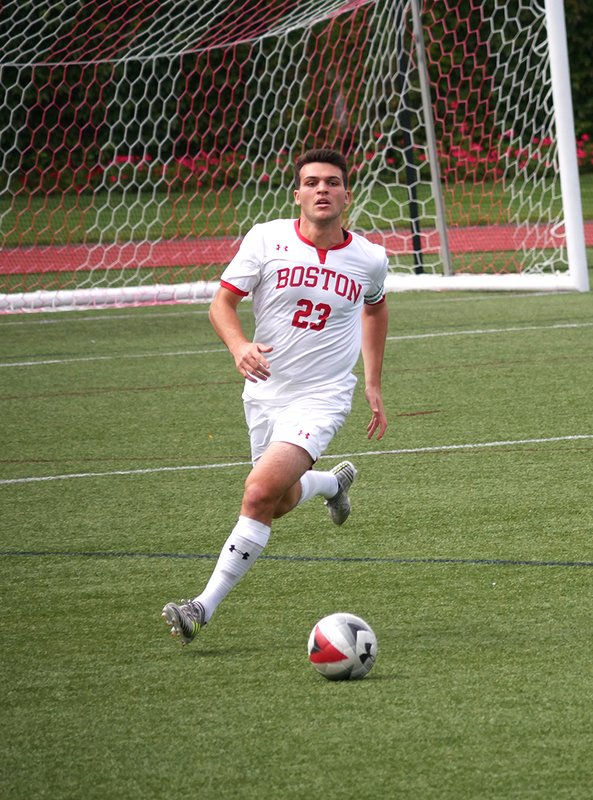 The Boston University men’s soccer team staged a comeback in its conference game against Bucknell University, coming out as 2-1 winners and confirming the team’s place in the playoffs. Before the match, the Terriers (5-9-3, 4-3-1 Patriot League) had been tied with Bucknell (6-7-3, 3-4-1 Patriot League) for fifth place in the Patriot League. The Bison must now wait until next weekend to determine their fate. BU head coach Neil Roberts commended the team’s efforts in this evening’s match. The Terriers were slow off the blocks and took over an hour to register their first shot on goal of the game, by which time they were already a goal down. BU fell behind in the 40th minute when Bucknell midfielder Alex Clarke placed the ball into the bottom corner after a darting run from the right wing. Though both teams took the same number of shots in the first half, none of BU’s shots were on Bison goalkeeper Ryan Ott. In the second half, the Terriers adopted a more direct approach, hoofing balls down the middle and into the channels for wingers to run onto. Bucknell’s defense remained resolute, and as the game progressively became more physical, it dealt with the long balls and diagonal crosses with ease. In the 54th minute, Bucknell had the opportunity to wrap the game up, but sophomore midfielder Cody Wax’s stinging shot rattled off the post. The Terriers’ goal came against the run off play when Ott fumbled a free kick from the halfline and let the ball bounce behind him for freshman midfielder Kari Petursson to square for senior defender David Riccio’s finish from close range in the 69th minute and push the game into overtime. The goal was the senior co-captain’s first of his BU career. “We were playing in an an attacking mode and we decided to keep going on for the win,” Roberts said about his team’s attacking impetus in the last 20 minutes. While the Terriers continued its attack, five saves from senior goalkeeper Mike Bernardi kept the Bison from walking away with the three points. In the 81st minute, Petursson missed an opportunity to finish off the game when his header shied just wide of the post. With neither team able to get the decisive goal within 90 minutes, the game moved into overtime. Under seven minutes into overtime, a curling cross from the left was headed home by a diving senior midfielder Adam Wright, sealing the three points for the Terriers and cueing their celebrations, with Wright ripping his shirt off and being mobbed by the entire team. When asked about the positives he took from the game, Roberts said it was his team’s fight and adherence to the plan that had him feeling confident for the upcoming games.